President Donald J. Trump delivered his first State of the Union address since taking office, calling the current era “our new American moment.” But he missed an opportunity for substantive conversation on the growing concerns around education in the country, some in higher education observed. 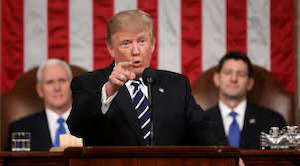 While Trump’s Tuesday night address touched on Congress’ progress on tax reform, the economy, national defense and the president’s four-pillar policy proposal on immigration, higher education scholars and policy experts noted that there was little mention of K-12 and higher education policy beyond an appeal for an investment in workforce development through the opening of vocational schools. “The biggest surprise last night was that there was no mention at all of school choice and charter schools, which is kind of the favorite topic of the president and of the [U.S. Education] Secretary and really of the Republican Party, more generally,” said Dr. Jon Valant, a fellow in the Brown Center on Education Policy at the Brookings Institution. Following the address, U.S. Secretary of Education Betsy DeVos affirmed the president’s call for more emphasis on vocational education and workforce training. Some education leaders said they would have liked for the president to have delved into issues of college affordability and access, accountability and protections for student borrowers and ways to increase college completion. Regarding Trump’s emphasis on vocational schools, Pilar said that “while that’s a viable pathway for some students, we know that the greatest gains are at the bachelor’s degree level or higher.” At the Education Trust, education leaders hold to the mantra that “education is the surest path to the American dream,” Pilar said. “Given the assault that we’ve seen on the American Dream and higher education … these are parts of the conversation that could have been lifted up that weren’t a part of that discussion at all yesterday,” Pilar said. As the president’s address segued to the issue of immigration, there were concerns that new legislation on the Deferred Action for Childhood Arrivals (DACA) program would leave many so-called dreamer students vulnerable to deportation. Further, rhetoric promoting increased immigration enforcement and reduction of overall legal immigration into the country overshadowed efforts to help DACA recipients, some of whom are teachers and graduating students.